Waiting for a special day to set the table is such a waste of life. Any day is special. A lovely bouquet of flowers, a simple place setting with just a little stylizing is so easy to pull together. This light lunch table setting required a quick trip to the grocery store for the white hydrangeas, the cabinet and pantry room and then just a little mixing and matching of table ware. 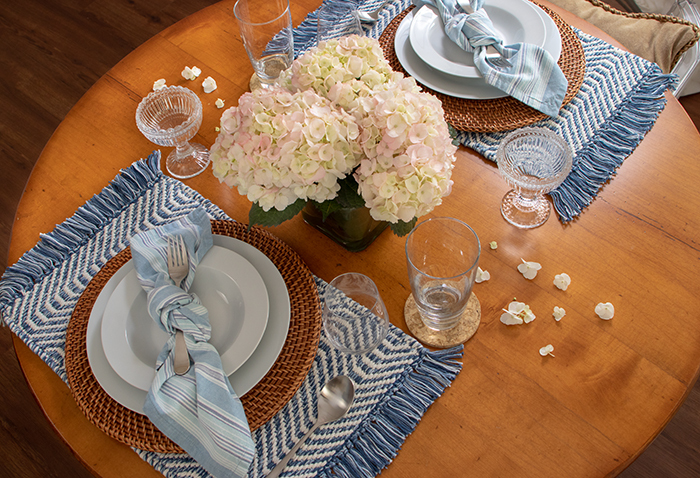 I had settled on the colors of blue and white grounded on the earth colors of the wood table and woven plate charger. 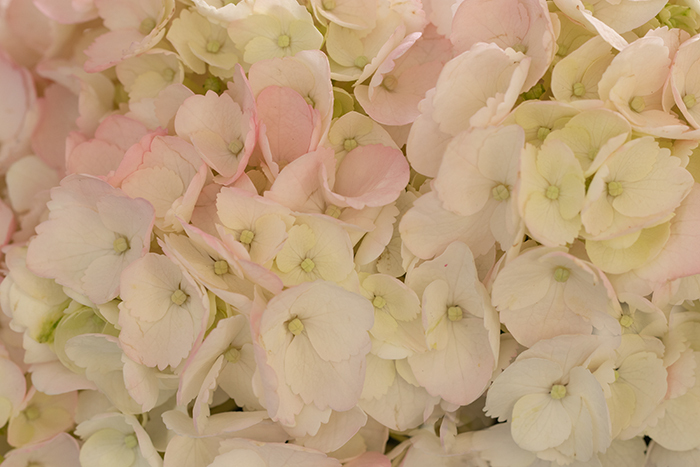 The blue and wood tones are cool colors, so I contrasted them with the warm colors in the pinkish hydrangeas. Three huge bouquets of them visually balance with the size of the placemats and china ware. Napkins don’t have to be neatly folded on the left side next to a folk. Add a little style, such as knotting the napkin and slipping the folk through the knot. Mixing patterns is fun to do. The key to successfully doing this is to keep the colors in the same hue. If you want to give it a kind of wild mix of patterns, pattern sizes and colors, you will still need to pay attention to color hues. But that’s an artistic topic for another time. Water, wine and scoops of sorbet were being served. I wanted to make this a casual lunch table setting and so I added a mix of glasses. The menu included a Two-Cheese Potatoes Au Gratin With Bacon, a Fruity Nutty Salad with Orange Ginger Dressing and multi-grain harvest bread. 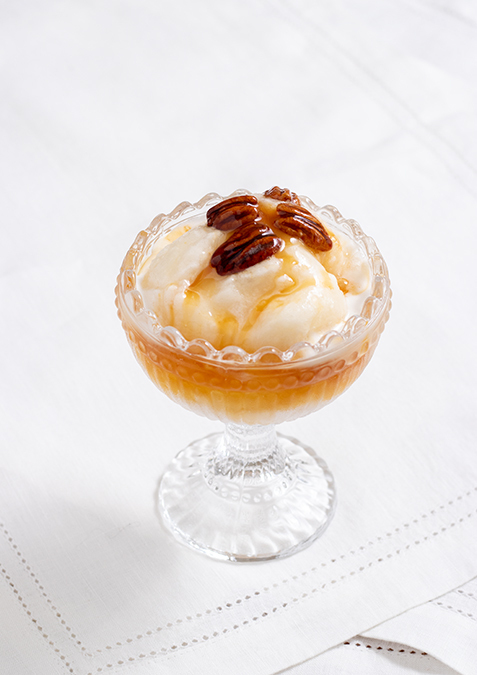 To freshen the palate, scoops of lemon sorbet topped with pecans and caramel syrup was served. It wasn’t expensive. The china ware was purchased on sale some time ago from open stock at Williams Sonoma. 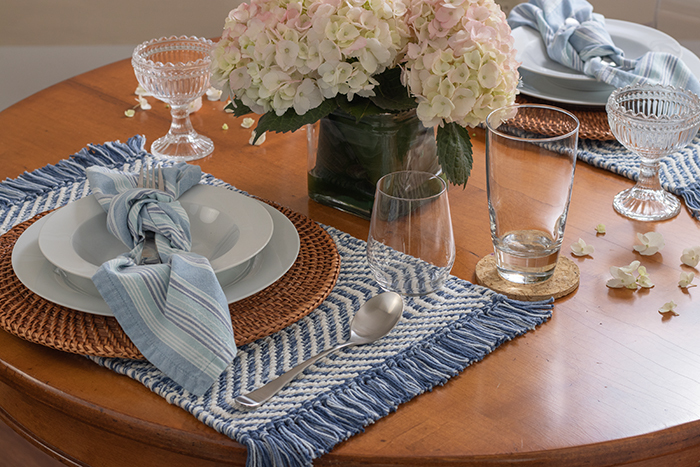 Also purchased on sale were the blue and white place napkins and the woven placemat with fringes from Pier One. Chargers are always a bit on the pricy side at any store. In that case, I do save up to purchase chargers, hunt for sales or just buy a couple at time. The different patterns were kept to similar sizes. Colors, while reflecting nature, remain in the same hue. White there is no central theme to the light lunch setting, the bouquet of hydrangeas ties it together.